Depression following an acute coronary syndrome (ACS) affects 2 in 5 patients and is one of the most important psychosocial predictors of a poor cardiovascular prognosis.1 In the Coronary Psychosocial Evaluation Studies (COPES) randomized controlled trial, we compared the effectiveness of enhanced depression care, which comprised patient preference for problem-solving psychotherapy, antidepressant use, or both, through the use of a stepped-care algorithm, with usual care in patients with ACS and persistent depressive symptoms 3 months after discharge.2 The 6-month trial demonstrated that enhanced depression care improved patient satisfaction with treatment and reduced depressive symptoms. However, the intervention's impact on health-related quality of life, health care utilization, and cost-effectiveness has not been evaluated. To help bridge this gap and inform decision making, we undertook a cost-effectiveness analysis of enhanced depression treatment in patients with ACS and persistent depressive symptoms using results from the COPES trial. The mean (SD) age of the study population was 60 (10.6) years, and 53% were female, 49% were Hispanic, and 19% were African American. At the 6-month follow-up, greater improvements in health utility were observed in the intervention group compared with the usual care group, although were not statistically significant (0.60 vs 0.56; P = .07). Among patients randomized to receive enhanced depression care, 51% reported using antidepressants or anxiolytics compared with 30% of patients receiving usual care, with mean costs of $261 compared with $236 (adjusted difference, $18; P = .81) (Table). Use of mental health care was also more frequent in the intervention arm, with 75% visiting a mental health specialist at least once, compared with 35% in usual care arm (mean cost $585 vs $58; adjusted difference, $535; P < .001). The frequency of visits to cardiologists and primary care physicians was similar in the intervention and control groups, with 88% and 92% of patients reporting at least 1 cardiology appointment and 95% and 92% of patients reporting at least 1 primary care appointment, respectively. Mean total costs for ambulatory care in the intervention group were $1083 compared with $554 in the usual care group (adjusted difference, $536; P < .001). The higher costs of mental health care and higher use of psychotropic medications in the intervention group were offset by savings in hospitalizations for major adverse cardiac events and heart failure. Overall, 5% of patients receiving enhanced depression care compared with 16% of patients receiving usual care were hospitalized for stable angina, unstable angina, ST-segment elevation or non–ST-segment elevation myocardial infarction, or heart failure. This difference in hospitalization rates resulted in a cost difference of −$1782 (95% CI, −$3163 to −$402; P = .01). Mean total health care costs, including costs for psychotropic medications, ambulatory care, and hospitalizations, totaled $1857 for the enhanced depression care group and $2797 for the usual care group (adjusted difference, −$1229 per patient; 95% CI, −$2652 to $195; P = .09). Because the intervention was cost saving on average, no mean cost-effectiveness ratio exists. Bootstrap analysis demonstrated that if society is willing to pay $30 000 per quality-adjusted life-year gained by enhanced depression care, the probability that this treatment approach will be considered cost-effective is 98%. To our knowledge, this analysis is the first economic evaluation of enhanced depression treatment in patients with ACS and persistent depressive symptoms. 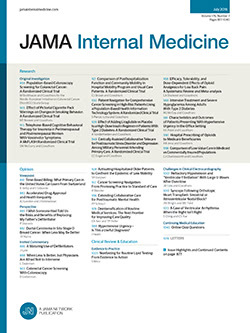 A growing body of evidence suggests that mental health problems complicate physical health conditions and that this relationship worsens clinical outcomes,1 increases hospitalizations,5 and adversely affects quality of life.6,7 Another recent study of patients with depression and poorly controlled diabetes mellitus or coronary heart disease found that a multicomponent treatment program, with particular emphasis on depressive symptoms, reduced health care costs.8 The findings from our study support this conclusion, while highlighting the need for larger studies with longer follow-up to examine the robustness and durability of these findings. Correspondence: Dr Ladapo, Department of Population Health, New York University School of Medicine, 550 First Ave, Room 614, New York, NY 10016 (joseph.ladapo@nyumc.org). Author Contributions:Study concept and design: Ladapo and Davidson. Acquisition of data: Ye. Analysis and interpretation of data: Ladapo, Shaffer, and Fang. Drafting of the manuscript: Ladapo and Davidson. Critical revision of the manuscript for important intellectual content: Ladapo, Shaffer, Fang, Ye, and Davidson. Statistical analysis: Ladapo and Fang. Obtained funding: Davidson. Administrative, technical, and material support: Shaffer and Davidson. Study supervision: Davidson. Funding/Support: This study was supported by National Heart, Lung, and Blood Institute grants HC-25197, HL-088117, HL-101663, and HL-84034. Support for Dr Shaffer was provided by Health Resources and Services Administration grant T32 HP10260 and American Heart Association grant 12CRP8870004. Support for Dr Ye was provided by an American College of Cardiology/Merck Research Fellowship award and by National Institutional of Health grant T32HL007854-16.